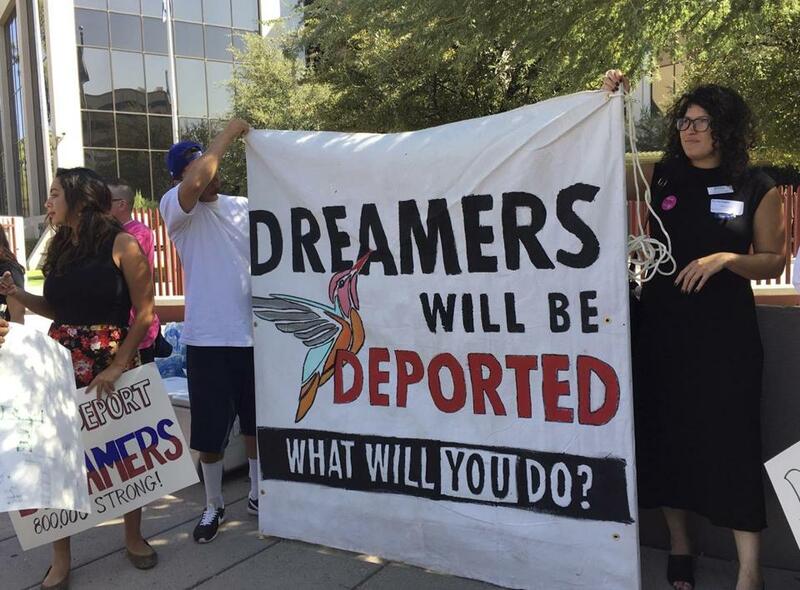 Immigrant rights groups rallied for DACA on Aug. 28 in Phoenix. Scripture teaches us that we should welcome the stranger, for we were once strangers ourselves. That simple lesson offers special meaning for us in America. We remain the immigrant nation, a country founded and sustained by those who came here in search of a better life. We urge President Trump to take this legacy to heart as he reportedly plans to end the Deferred Action for Childhood Arrivals program, or DACA, with a six-month enforcement delay. We ask that he reconsider throwing into chaos the future of 800,000 young people in the United States, and nearly 19,000 in Massachusetts alone. 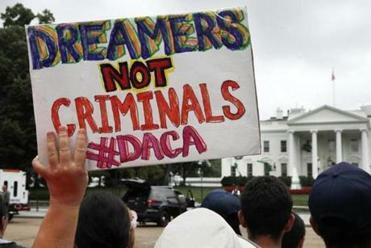 These young people, often referred to as Dreamers, attend our schools. They play sports with our children and live in our neighborhoods. They worship and work and volunteer alongside us. Many serve in our armed forces. They are not citizens. But they are Americans. Those enrolled in DACA were brought to this country as children. In many cases, America is the only home they have ever known. Some don’t even realize they are undocumented until they apply to college or for a job. That’s why, five years ago, the federal government created the DACA program. Instead of waiting for overdue national immigration reform, this program offered young people a path out of the shadows. They had to come forward to register, submit to criminal background checks, and begin the journey toward legitimate citizenship. In return, they received temporary protection from deportation, and the ability to work and attend college. Ending an Obama-era immigration program would hobble Houston just as it needs workers most. Here in Massachusetts, DACA is working. Studies show that these young people are getting higher education degrees and finding better paying jobs. That grows our workforce and contributes millions to our economy. Those of us in law enforcement have seen the clear guidelines of the DACA program open up new avenues of trust and cooperation in our communities. We rely on members of the community to come forward to enlist our help. Without DACA, many will not feel comfortable doing so, for fear of deportation. Serious crimes will go unreported, and criminals will go free. Those of us in religious communities have been able to minister to people who do not have to live in constant fear of deportation raids. Our region has always been blessed with a diversity of cultures and backgrounds. We see that heritage within our places of worship as well and are proud to have pastors and members of our parishes who hail from as far away as Ghana and Brazil, El Salvador and China. DACA has helped strengthen our communities by ensuring everyone feels welcome to join us in prayer. This program was a promise from our government to these children that playing by the rules would pay off. Now Trump is considering ending DACA, breaking that promise and putting families at risk. Already, inflammatory rhetoric about immigrants has created a culture of fear that harms public safety and undermines our communities. We have heard from parents who pulled their children out of school and cancelled doctor’s appointments. Ending this program would further encourage this dangerous retreat into the shadows. But the DACA program is not just about public policy — it is also about public morality. We believe that every person is worthy of dignity and that we are strongest when every member of our community has a chance to succeed. From the streets surrounding Boston Common to the areas of Houston and the Gulf Coast devastated by flooding, the last few weeks have shown us what is possible when our communities come together on behalf of those shared values. Trump recently said that he wanted to invite immigrants to the United States who could hold a job, contribute to our society, obey our laws and serve our country. This is precisely what DACA young adults and children are doing; they are serving in the military and pursuing their education. They want to be productive citizens. The young people registered in the DACA program are exemplary. They have followed the rules. All they ask in return is a path to citizenship in the only country they’ve ever known. We hope Trump will answer their prayers. Maura Healey is attorney general of Massachusetts. Cardinal Seán P. O’Malley, OFM Cap, is Archbishop of Boston.